Documentary exploring how, in the 1960s, the British people fell in love with animals and how endangered species and wildlife protection became an intrinsic part of our culture. Browse content similar to When Britain Went Wild. Check below for episodes and series from the same categories and more! We've all been taught to see the '60s as a wild decade, a time of sexual and cultural revolution. when our attitudes to animals and nature were completely transformed. our lives, and a new respect and reverence began to grow. That relationship between man and animal completely changed. People were just ready to start thinking a little bit more widely about animals. Writers like Gavin Maxwell and Gerald Durrell helped us to appreciate and value animals. research on primates, showed us that animals had something to teach us. We're not separate from the animal kingdom. We don't rule over it, but we're part of it. That was something new. Before the '60s, the British public knew very little about wildlife protection. Groups such as the World Wildlife Fund or campaigns to save the whale didn't exist. In fact, the very idea that animals might be endangered came as a big shock to us. That was a big wake-up call. Yes, it was a big change of attitude. of their surroundings and the natural world around us. And a new word began to be used - the environment, a word hardly recognised before the '60s. The idea of "the environment" as a way of talking about what surrounds you was novel. It is stunning, the transformation in attitudes. In fact it's one of the great untold stories of British social and cultural history. of When Britain Went Wild. was long in the making, but the post-war years were key. At that time, few people were engaged with nature or wildlife. when protecting animals was all about preserving hunting stocks. But there was one man who would change all that. behind the first-ever mass membership wildlife group. which would inspire a generation into caring for animals. it would be Peter Scott. He was a remarkable man. who was anywhere near as influential as Peter. but in terms of public presentation, Peter was incomparable. Peter Scott was born into a family of an elite class of Englishmen from an earlier age. he had died in his attempt to be the first man to the South Pole when Peter was just two years old. Such a background of wealth and privilege was common among many of the early naturalists. Peter Scott enjoyed the great outdoors. Although we may now find this surprising, he was a passionate hunter. and I think it's still there. but I don't want to cover it up because it's true. I hate to think it was so, but it was so. In our generation, that wasn't an odd thing to do. and shooting was absolutely part of ordinary life. is a route that many others have followed. It works for people. not as a hunter but perhaps as a city-dwelling nature lover, might find inexplicable. But the truth of the matter is that there are lots of hunters who have become conservationists. but his conversion was a turning point in his life. and it was wounded - it broke its legs. It was out on the mudflats and nobody could get to it. and it was there the next day. he didn't enjoy this and he didn't want to do this any more. to studying their behaviour and eventually of course to conservation. he set about creating a sanctuary for wild and endangered birds. It became the Wildfowl & Wetlands Trust at Slimbridge in Gloucestershire. First of all, they lived in a little cottage. the part that they bought. with wild ducks coming in and landing practically in front of you, you know - "splash"! in letting them get close to the birds. and complexity of the natural world, and getting them enthused and passionate and engaged with it. I was very small when it was set up. It was all a lot barer. There was much less growth. The people were allowed everywhere. People were allowed into this pen as well. That was an interesting concept, that we had our meals overlooked by the public! If they would look in with binoculars, sometimes we'd look back at them with binoculars. I mean, we had the freedom of the pens. with my little box camera, being so excited that I could get pictures of birds really, really close. The success of Slimbridge was helped by Scott's connections. to bring some rare trumpeter swans back from Canada, which she did. But then he had always mixed in very influential circles. and she knew all sorts of people in government and elsewhere. She introduced my father to all sorts of interesting people. Of course, he was already and Olympic skater and a yachtsman, and all the other things that he did. So his skills helped him to meet these people with his own confidence that he could do things. at Slimbridge and all the rest of it. And did it with such eloquence and such a commanding understanding of the natural world. And his love of it just communicated itself to people almost effortlessly. "Even if you don't belong to such an organisation..."
where Scott presented several popular wildlife programmes. But it was television which would make him a household name. who would discover Scott's talent for the screen. We went along to see him do this lecture. He stood up on the stage, he talked to the people - he had them in the palm of his hand. He had a big blackboard on the stage, and he sort of drew his ducks. And then he showed little bits of film, short squirts of film on a big screen there. and would run for a further 26 years. and just inside is where I am, sitting and talking to you now. were broadcast live from Peter Scott's house at Slimbridge. On the easel here is a picture I haven't really quite finished, actually. the view you have just been looking at, through the window, across the pond. typically British in the way of ducks out there on the pond. We would have Peter sitting down in his studio, what was effectively his studio. and he could turn and draw the duck for you. ..part of the collection birds, and put them into this enclosure here. but also do drawings to make a particular point. It's difficult for a daughter to say, but I think that he was very charismatic. He was very articulate, so he explained things very clearly. Certainly, it was new, it was a different thing. Wildlife hadn't been shown in that way at all before. cos it was very hot, I remember, when the lights were on. And us children used to sit in the background. It was always a big event, lot and lots of wires. George, the golden eagle is fairly secure. It's still a rare bird, but it's fairly secure in Scotland. Peter Scott took to television like one of his ducks to water. And Look enjoyed unrivalled success with an ever-increasing audience. Peter was a lovely man. He was very easy to work with, certainly. But everything had to go his way. and have a little bit of a tantrum. But always in the interest of the job that you were involved in. that wildlife needed to be protected. to prevent animals from becoming extinct, what can we do about it? and try and breed them there and build up the stock. Now, here at the Wildfowl Trust, we have done that with several species. Peter Scott recognised the importance of conserving wildlife. He was also aware that engaging the public in this battle was crucial. in persuading people to care about animals. which lent itself to engaging the British in a love of wildlife. There were two kinds of television programmes. and a man from London Zoo said, "This is..." whatever it was. before it was stuffed back into a sack and taken away. We're going to show you some of our special favourites from the zoo. The first being Peter, a chimpanzee. The next one we're showing you is a cockatoo named Old Bill. or escape or pee down his front or those sort of things. So it was live television. Well, I've got a handful here! And hello, how are you? And then there was a couple called Armand and Michaela Denis. The title of our first chapter today is Search For Gertie. -You had better explain who Gertie is. from studio-based programmes and hugely popular in the '50s. or if this animal was still alive. in the old Amboseli Game Reserve. Armand and Michaela had been filming in East Africa for a long time. They actually put together a feature film. the outtakes and made a 30-minute trailer which gave it publicity. And the BBC put it on and it was sensational. Everybody went, "Gosh, look! Elephants, ooh!" Fabulous. And so those were the two things. But it didn't have the immediacy that the zoo programmes had. And hello, how are you? was that they showed animals out of their ecological context. "if we combined the two qualities of those things?" The live show of the animal that's on the table, but also a film. to catch animals for London Zoo, which is what zoos did in the 1950s. This is the story of a search for a dragon. The island on which it lives lies in Indonesia. which we hoped to find on our way. Lizards of all sorts were very common around the village. And one of the commonest, and in many ways the loveliest, I saw in this small tree. It is a Tokay gecko. And here he is in the studio. Quite a big gecko, as geckos go. And quite a fierce one. mice, lizards, and even young birds. Yes, I mean it's a mercy that nobody ever sees those programmes any more. I wouldn't mind if the BBC lost them! which are attempts at decent natural history filming. just how incredible it would have been to be one of the first viewers of something like Zoo Quest. who maybe have never travelled outside their own town, you know. They might have lived in Bradford all their lives. 'I discovered that this temple was sacred to the cave's inhabitants. There was the dragon. This was tremendously exciting for us. Something that you could never envisage seeing otherwise. the great variety of the planet into your living room. Before the '50s, it would have been inconceivable. to the huge variety of wildlife around the world. in stimulating people's environmental interests. as they explored more and more of the natural world. of their exotic underwater adventures. 'of the many varieties of coral fish in the Red Sea. There was this Austrian couple with a dream life. The Xarifa, it was called. who was continually diving over the side and swimming down, grappling with a monster from the deep. And Hans with his beard, "Lotte is going to do this," and so on. Riveting. I mean, I couldn't wait until the next week. They were before Cousteau appeared on television. that was the first time you'd seen under the waves. That was the first time you'd seen a coral, that was the first time you'd seen a shark underwater. which I developed for an ordinary twin-lens reflex camera. And that's my camera. It's smaller and handier for the shots I like to take. of the underwater world, really. watching the human species was as interesting as watching the underwater films. to everybody's front room for the first time ever. 'This is my special friend, the puffer fish. I worked with Hans for 18 months on Diving to Adventure. He wasn't great on his writing. we got Johnny in to do some rewriting on his material. "we feel very close to God." You see? And we were not so keen on this. And Johnny would rewrite some of his stuff. But he was great, Hans, a really good guy. Although television at this time was in its infancy, the appetite for wildlife programmes was strong. The British public was discovering it had a fascination for animals. But it had yet to find a way of taking this beyond the screen. Relatively few people were committed to an interest in wildlife. Societies didn't have big memberships. The RSPB was a relatively small society. The British Trust for Ornithology was practically a handful of people, with very few members. And it grew exponentially really, and I think largely because of television. to something they were already programmed for and hadn't realised. which started to challenge people's perceptions. In 1966, the film of Joy Adamson's book, Born Free, became a blockbuster. brought up a lion, eventually releasing it back into the wild. The film starred Virginia McKenna and her husband, Bill Travers. Based on a true story, it was unique in the near-documentary way the actors had to work with the animals. It challenged the idea that a wild animal was something to be feared. of course, in this case, was changed by the story of 'Born Free'. it was like a fantasy, and yet it wasn't a fantasy. about relationships between man and wild animal. And I think it was so uplifting for people. It opened so many doors for them. We had the fierce wild animal and the human that's terribly afraid of it. And this knocked away all those misconceptions. audiences were presented with a completely new concept. For Virginia, the close relationship she had to build with the lions to make the film was a revelation. The making of Born Free had a lasting impact on Bill and Virginia. Our life was completely changed from that moment onwards. from that very moment, our life had changed forever. Joy Adamson's work revealed how close we could get to wild animals. who would take this even further. a British researcher, spent years studying primates in the African jungle. She opened a window onto their lives, which showed how much we have in common with them. Jane Goodall is totally unique. you know, absolutely on her own. that gave her study animals names. Before, they were just called by numbers or letters, or something. But she gave them names. and of course that's what brought all of us into the story. that the boundaries between human and animal were much more blurred. we were effectively part of the same kingdom, if you like. but it was that you're both participants in the natural world. we are not separate from the animal kingdom. We don't rule over it, but we're part of it. That was something new, that sense. hung down like bell ropes. was also being explored in a new wave of literature, in stories which would influence a whole generation. and even became part of the school curriculum in Britain. He wrote his most famous book in 1956.
and his adventures with a whole host of wildlife. "the sea seemed to part with a gentle swish and gurgle. "gave a deep, satisfied sigh and sank below the surface again. "before I found I was right in the midst of them. "their black backs shining as they humped in the moonlight." He made animals so accessible to people. if you can say animals have such things. Some people said, "Oh, Gerry's writing's just anthropomorphic. "He just gave human qualities to the animals he wrote about." If you read it very closely, it's not sentimental. sort of a connectivity between people and animals. I think that's why Gerry's writings have been so influential. particularly My Family And Other Animals. It's not them and us, humans and animals. The animals are given human characteristics, they're given personalities. them cute and cuddly and amusing, and all those kinds of things, that lead us to sympathise with them. Gerry was huge fun to be with. ..full of humour, full of jokes. Many people's views of wild animals come from the pages of books they discovered early in life. Besides Durrell, there was another author writing at this time whose books influenced millions. Gavin Maxwell became world famous for his semi-autobiographical book, Ring Of Bright Water. Published in 1960, it told the story of his adventures living with a wild otter. It would later be made into a film, once again starring Virginia McKenna. ..who had many dark periods in his life. And not all the stories of the otters are that joyful. his extraordinary gift of description of nature. The magic of his creative writing. It's all about involving us, isn't it? Allowing us to reach out and experience the things with the writer. It's gathering us in so that we share these experiences. And he was a master of that. "among the host of wild creatures with which I was surrounded. "the white beaches and the islands. "His form became the familiar foreground to them all. "Or perhaps foreground is not the right word. but it was the personal connection with basically wild animals. between man and beast was something I found hugely attractive. like it was with the Adamsons and Elsa, it was Gavin with Mij. And the possibility that these extraordinary relationships can happen. who, of course, don't live in the countryside. and otters and all of this kind of thing. They conjure up a world that most people, of course, wouldn't encounter in their daily lives. by not being preachy, and I think that's what made them so effective. But for Gerald Durrell, his books were only part of the story. They became a means to an end. As his fame increased, he used his influence and money to try and change the very concept of the zoo. but before the '60s, people didn't appreciate that wild animals might be suffering. Zoos hadn't changed much since Victorian days. was just something we can't really fathom today. No real respect for animals. and cataloguing specimens, as David Attenborough encountered during his Zoo Quest days. and it wasn't founded as a zoo, it was founded as a Zoological Society. so it was still a hangover from the 19th-century cataloguing days. So that it led to things that you would think absurd now. I don't know, a large greenhouse. and they had a little box at the back which was the nest box. the Gambian pouched rat, etc. And you could probably see not a single animal, they were all asleep. But that was of no consequence to the Zoological Society of London. but they were particularly interested in having the dead body. and dissect them and publish the results. 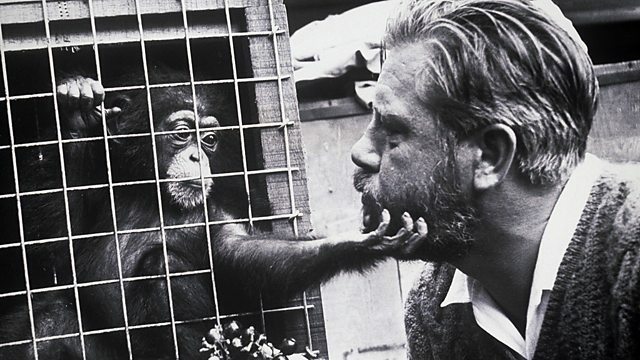 As a young man, Gerald Durrell had been an animal collector for zoos. He'd spend months travelling the world and catching animals to bring home. -But as time went on, he became increasingly disillusioned. "Well, there are plenty more where they came from." for so many months and then just to hand them over, well, that drove him absolutely mad. it would have to be able to do certain things. It would act as a sanctuary for animals which were in danger in the wild. and to enable the animals to be looked after with much more skill. of captive breeding, breeding endangered species in zoos and later releasing them back into the wild. he looked to pioneer Peter Scott for inspiration and advice. Gerry had great regard and great respect for Peter. that eventually happened in Jersey, on Peter's. Gerry, he loved animals but he also loved twisting the tail of authority. He was not a man who was necessarily a respecter of persons or position. by and large, that they didn't know how to look after animals properly. And that he was going to teach them. London Zoo COST, and here was Gerry, going to set it up. I mean, like digging a hole in which to pour money. # Does your heart understand? Gerry was the first to take seriously the possibility of breeding in zoos to replace in the wild. It's a very big job to do that. There's more to it than meets the eye with this business. which indeed it is, was and is. and famous around the world as a centre for conservation. But in the early days, it was a continual battle to finance the project. and from television appearances, where his natural talent was soon recognised. I don't think we ought to go into that, Peter! We ought, perhaps, to look at Patagonia on the big map. Yes, I'd like to show you where we went, Peter. a whole bunch of animals and was keeping them in Bournemouth. to all these other people in those days, "Have you got any film? "Did you film while you were there?" "Yes," he says. He had his Mickey Mouse camera, and he filmed the animals while he was away. So I said, "Are you interested in the thought of being on telly?" "but they won't have me because they've got David Attenborough." He was paranoid about David, you see, so I said, "Not necessarily." in the centre of Malaya. of Malaya's national parks, and it's a journey that takes about six hours by boat. By this sort of boat, anyway. I can see some rough water ahead. that he'd used in his books. You see that strange white throat that he keeps inflating? Looks rather like the sail of a sailing ship? who's wandered into his territory. Though it doesn't look like it, it's actually a flying lizard. The wings aren't really wings at all in the sense that a bird or a bat has wings. They're rather like two sections of umbrella on each side of his body. Thin skin supported by elongated rib bones. it would probably be more accurate to call him a gliding lizard. If you wait long enough, you can sometimes see them performing. Now, I think he's going to take off. he would've been a film-maker. And he certainly saw that as a way to get the message across. and tried to do that as often as he could. to raise people's awareness about the plight of endangered species around the world. animals in danger of becoming extinct. their place in our lives today and their place in our lives tomorrow. millions of lions, millions of elephants, millions of giraffes. Well, it just isn't true. than there are wild in Africa. "You know, don't you, all these are in danger?" it did make you wake up. But raising awareness at home wouldn't be enough. Peter Scott needed to take his message to an international audience. at a conference held by the International Union for Conservation Of Nature. to protect endangered species for future generations. for the charter, helping to form the World Wildlife Fund. which is being launched to give it teeth. for our children's grandchildren, if only we care enough. It would be tragic, wouldn't it, if, through our own thoughtlessness, we destroyed them forever. that this was a global problem. Birds migrate across political frontiers. Animals migrate across political frontiers. Scott was trying to see a wider picture of this on a global scale. In pre-war times, in the days of the Empire, getting things done on a global scale was much easier. who could get laws forced through. international conservation group for the preservation of wildlife. to try to respond to this problem and to provide some limits to allow game species to recover. for such things, and they were seeing that their recreational hunting was at risk. they were shooting, and keenly aware of the decline of species, keenly aware of the loss of habitat. in Africa and India as national parks. that the newly-independent ex-colonies would not protect their national parks from poachers. to protect endangered species, they had to engage the widest-possible audience. in the service of the charity. it ought to be furry and cuddly. which was immediately identifiable and easily reproduced. so it came down to a panda and Peter designed the panda. creating an iconic image which is still in use today. rather than something that was just under the control of governments. and know that you were doing something. One of the first campaigns WWF ran in 1961 was for the plight of the black rhino. but the paper carried it on its front page and for several pages inside. of ecosystem structure, but it's the one that really strikes a chord with the British public, then. introducing the wider problem of the loss of species, the loss of habitat. from individual donations and local charity events. and in that, I think, was its power and its influence. the big, attractive animals were used. started to get a lot of general support because people realised, "Wow, it does matter to me." back home there was an invisible threat to wildlife which was only just beginning to be noticed. Rural Britain, romanticised by poets and artists for centuries, was changing. were becoming notable by their absence. that something awful was happening. the UK's wildlife was under threat from man-made chemicals. of researching the impact of pesticides. were really very dangerous things to have in the environment. it was sprayed one year and it would remain in the soil a lot later. These pesticides had a profound effect on one of the UK's favourite birds of prey. the decline of peregrine falcons, Derek Ratcliffe, hit the news with his pioneering fieldwork. in the south of England or Wales where there used to be good numbers. His findings showed that sprayed crops were eaten by pigeons. They, in turn, were consumed by peregrine falcons, with devastating results. He estimated that more than half of their population had disappeared. started laying eggs with abnormally-thin shells, which easily broke. but attacked by the authorities and had to be defended by scientists. can accumulate and do harm to a species over very large areas. And this I think is important. they didn't like it at all, what we were doing. we wanted people to get involved and solve the problems. Unlike today, people didn't fear pesticides. In fact they saw them as modern saviours. And mosquitoes were spreading malaria which was killing our troops. that is, killing nasty bugs. After the war they were still in popular use to improve food production. the public were unwilling to hear that there might be a hidden cost to their new quality of life. see only the good pesticides do. for feeding the hungry, which is how it was perceived at the time. and should be widely celebrated. helping farmers to grow food much more successfully. 'in the most heavily infested areas. But in 1962, a revolutionary book was published which would profoundly change this view. 'where all life seemed to live in harmony with its surroundings. 'Then a strange blight crept over the area and everything began to change. 'Some evil spell had settled on the community. 'Mysterious maladies swept the flocks of chickens. 'The cattle and sheep sickened and died. 'Everywhere was a shadow of death. 'There was a strange stillness. 'The birds, for example, where had they gone? Rachel Carson was an American biologist and writer. questioned the use of toxic chemicals in the countryside. It had a huge effect on the public. It was a public book about it. and a very readable book. It exaggerates in places but it's basically true. we're certainly heading for disaster. the very nature of the world, the very nature of its life. These sprays, dust and aerosols are now applied almost universally to farms, gardens, forest and homes. and to linger on in soil. on the surface of the Earth, without making it unfit for all life? that perhaps hadn't filtered through to the general consciousness before. about where our food came from and suddenly, you're thinking about what's happening to our rivers? what's happening to them, and what are the consequences? # Where have all the flowers gone? the widespread destruction of wildlife in America by pesticides. to their environment, and to one another. in the early '60s it was leading-edge stuff. Rachel Carson had to do a lot of the fieldwork herself. There wasn't a huge body of literature that she could call on. they said, who is this woman? She's not a real scientist as we know a real scientist. and what does this tell us about anything? and the fact she was a woman, of course. in seeking to destroy her reputation, partly because she was a woman. Silent Spring, are gross distortions of the actual facts. and leave in their wake a train of destitution and hunger. and vermin would once again inherit the earth. Silent Spring is one of a number of blows. They kind of rain down on the reputation of scientific modernism. almost kind of gushing worship of science and technology. it's the first kind of dent in modernisation's reputation. has not come without cost. is that people, for the first time, realise what the costs really are. to actively campaigning for their welfare. which fed directly into the wildlife protection movement. they were now angry about images of seal culling. if you are an ugly and unattractive animal. and seals, which became totemic species. and conservation organisations of this period. In some ways, because people identified with them. People almost identify human qualities in them. with the fact that we were culling such a beautiful animal. This has been one of the great sea changes in British society. out there in the wider natural world. money from the comfort of their own homes, animal welfare had moved on. And, for some, it was now about getting up and doing something. on the anti-nuclear protests of the late '50s and early '60s. They had found a new freedom - the right to stand up and be counted. there was still quite a strong obedience in the British nation. used to being led with a degree of discipline during the war. was enshrined in British life. and we campaigned against this, that and the next thing. It was the age of protest. And that also helped take the conservation movement forward. they were free to express their opinions. of, "I can say something, my voice will make a difference. "They must listen. Look at us all, how many we are here." And that's probably what people felt at that time. the animal campaigns were attracting a wider range of people. from the image of being a very precious, middle-class activity. as a move from the upper-middle class to lower middle-class. but they're not from the top. And these people were often burning with righteous anger. they want to tear down the old order, they want change now. and channel it into the ecological movement. a different type of follower but essentially it was still a movement for a minority of people. that would change everybody's outlook. on to rocks just off Land's End. The Torrey Canyon was carrying a cargo of 120,000 tonnes of crude oil. when you mention the word, Torrey Canyon. It's a doomsday scenario coming true. but right on our front doorstep. and that's a very powerful image. It was a very big thing, yes. And it had a very important impact on the public. I think it was a big shock. Those images were just astonishing. is the moment where something that was invisible becomes visible. suddenly goes public, goes live, goes very visible. where people thought, "Wow, that's the dark side of the oil economy, that's one of the consequences." that there was a downside, a dark side, to that. for the first time, into people's lives. The Government called in the forces to deal with the disaster. It was treated as a full-blown military operation. Though it was an enemy people knew little about. 'The south-west coast was a battle area. 'grappled with the stupendous task of trying to fight off the oil. 'Enormous quantities of detergent were brought to the area. 'already floating on the sea. because politicians especially have to be seen to be doing something. because in a very few months it would be gone. vast quantities of this detergent, all along the beaches. 'Every tide left a thick covering of oil, to which detergent was applied with all speed. hoping the oil could be burnt off. had already been lost and the damage had been done. It was the worst possible time of year for the breeding auks. and gannets coming ashore on the beaches. People were setting up bird rescue stations all over west Cornwall. because they had the equipment. and rushed down to help and clean birds. We quickly realised it was easy to get the oil off them with detergent. so that they could fly again. And any number of birds were treated and then put back in the sea to die. in Britain was responsible for an environmental disaster? Which government department? Which group of civil servants? Nobody knew who was responsible for something like this. So it led to the standing Royal Commission on Environmental pollution in 1970.
put value on our wildlife. and agriculture, that sort of shift was quite radical at the time. it is not something that the world inflicted upon itself, we did it. The awareness of how vulnerable our planet really is became even more apparent in 1968.
it was thanks to a technological breakthrough. 5, 4, 3, 2, 1, zero. All engines are on. Lift off! We have a lift off. 32 minutes past the hour. the crew of Apollo 8 have a message that we would like to send to you. and the images brought the fragility of our planet into sharp relief. and, I hope, made a bit humble. because we couldn't get out of it and look back at ourselves. And the Earth was without form. it needed to be thought of as something that could be managed. And God said, "let there be light", and there was light. It fostered an idea of Spaceship Earth, of a common future. It fostered a powerful idea of us all being in this together. if we messed up this planet. good luck, and God bless all of you, all of you on the good Earth. It was an inspiration for the first ever Earth Day. that some of the most important issues were environmental issues. with climate change, that these are possibly THE most important issues. and banners, you know, those sorts of things that you did in the '60s. of all living beings and their physical environment. was to bring that to more and more people. and awareness of nature and wildlife was now part of our daily lives. It was stunning, the transformation of attitudes. in a way they just weren't in the early '60s. in the environment and the natural world and wildlife and so on. worship of science and technology. Now, by the early '70s that had almost completely collapsed. that progress brings with it. This change was reflected on television. In 1970, the BBC commissioned a hugely popular TV drama, Doom Watch. It covered themes like pesticides and chemical leaks. technology and big business as potentially sinister. Do you know, I shouldn't be at all surprised if this is a pesticide spray? Doomwatch is not a programme that would have been conceivable in the early '60s. It wouldn't have been commissioned. generally reflected scientific optimism rather than pessimism. My department is interested in pesticides. But by the early '70s there's been a complete change. Because I'm going to make sure that everybody sees you for what you are! We want to do a programme that 10 million people will watch. and the threat posed by big business. Doom Watch showed how much wider wildlife issues had become. new organisations being set up to appeal to all ages and interests. and Greenpeace did is to get into the thoughts and ideas of young people. was that this stuff became much more interesting to young people. had changed their attitudes towards animals and the natural world. and helped inspire a new reverence and respect for the wild. protecting species did matter and that we could all contribute. and, ultimately, caring for the whole planet. # Before it is washed to the sea? # And pretend that he just doesn't see? Timeshift explores the untold story of how Britain 'went wild' in the 1960s. It shows how the British people fell in love with animals and how, by the end of the decade, wildlife protection had become an intrinsic part of our culture. Before that time people knew very little about endangered species or the natural world - the very word 'environment' was hardly recognised. But the 1960s saw a sea change. The film discovers how early television wildlife programmes with David Attenborough, writers such as Gerald Durrell and Gavin Maxwell and pioneers of conservation such as Peter Scott contributed to that transformation.